The island of Genosha has a terrible past. It is emblazoned with the crimson flow of blood. 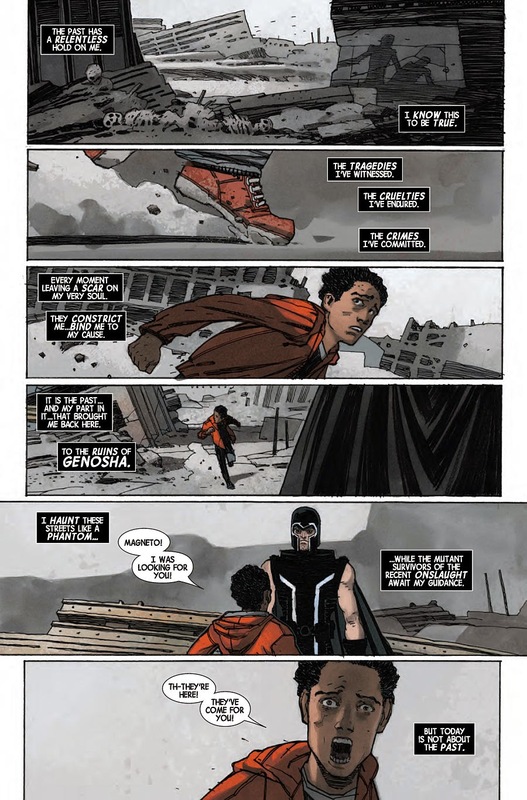 So, too, is the history of Magneto's deeds. Now the two are united again but must look to the future, for the protection and survival of mutantkind. As S.H.I.E.L.D bears down on Magneto, the Master of Magnetism must make a decisive decision that could leave his role as the protector of mutants in jeopardy. 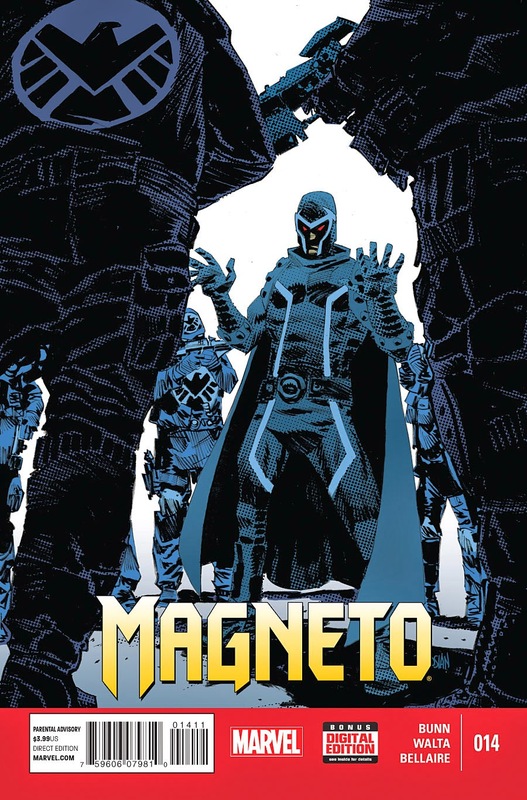 Writer Cullen Bunn keeps up the intrigue and suspense in issue #14 of Magneto. Coming out of the other side of AXIS, Magneto's true desires and focus remain uncertain. The combination storytelling just keeps readers coming back for more from a great series. Magneto fits perfectly with Bunn's current lineup of dark titles or characters. His ability to draw out the humanity of his characters, to peel back the overtures of evil and present solid, if imperfect characters, suits the type of story this series provides. Magneto must face personal demons in this issue and overcome his physical and emotional struggles to seek a different, if unexpected, outcome for mutantkind. Issue #14 presents a confrontation that Magneto may not be able to conquer in the same manner he would have previously. This is what a solo series should be like from Marvel. 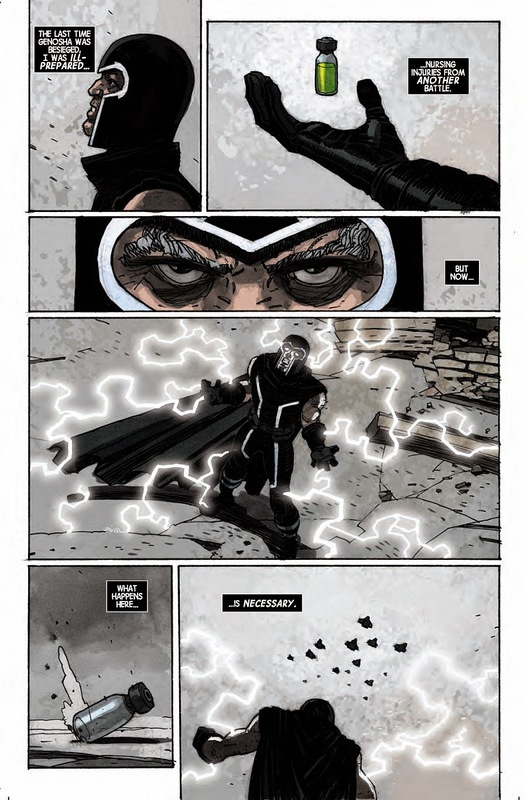 There is a distinct feeling and tone to the stories in Magneto. The creative team has set the series apart even further with details and art that you won't experience in other X-Men books. The moody and defiant attitude of the central character seeps into the creative output, making this a highly worthwhile comic to experience. This issue is not a bad jumping-on point for anyone who hasn't read the previous issues; it carries the recent events from AXIS well but—as has been done throughout the series so far—draws on much older continuity to give context to Magneto as a character. The great thing about this approach is that readers don't have to know a lot about the characters to enjoy the series going forward, it's user friendly like that. Regular artists Gabriel Hernandez Walta and Jordie Belaire return and get straight back into the swing of things. The art is right at home in Magneto #14. This team make a nice partnership that coalesces into a unique artistic expression of what is possible when Marvel takes a chance at a different kind of superhero comic. Belaire's colors are brilliant. There is subtle restraint, yet enough flair to speak volumes at the right moments. This easily could be turned into a black-and-white comic, yet Belaire enhances the visual experience by adding touches of color in places that add another level of gravitas. The stark contrast of flashback scenes and the present for Magneto are clearly demarcated by the use of color. With the recent announcement from Marvel about Secret Wars coming in a few months, I truly hope this series comes out on the other side of the All-New Marvel. This has been a highlight series each month. As always, we want to hear what you think about this issue and the series as a whole. Did you enjoy the suspense? What about Belaire's colors, what do you think they bring to the issue? Did you keep tabs on the Secret Wars announcement? Let us know and leave a comment below or on our Facebook or Twitter.